Introduction: Funding bodies have traditionally used attendance figures as a way of determining the allocation of funding for resources in the EDs. Using attendance figures only might not accurately reflect the funding and resources required. The need to create an easily implemented tool to compare workload and resources required was identified. Using the Australasian Triage Scale, a tool was developed to estimate staffing requirements and resource use within each ED. This, although currently not validated, provides a promising start in finding a way to accurately determine ED workload. Methods: Existing data on patient acuity, disposition, numbers of patients and the individual costing of each presentation was used to estimate and define the workload of an ED in emergency care workload units (ECWU). The tool is applied to six de-identified hospitals within Queensland to demonstrate its potential use for equitable budget and staffing allocation. Results: The tool was applied to a selection of de-identified EDs within Queensland hospitals. An increased number of ECWU is generated for a patient with a more urgent triage category reflecting a higher resource consumption and workload. Discussion: Although a few studies have been completed in Canada linking workload, resource consumption and cost to triage category, this tool will need to be validated before its use can be fully appreciated. 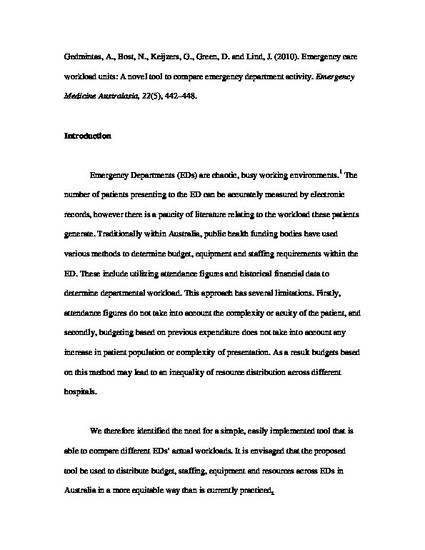 Conclusion: This tool provides a simple method to calculate equitable distribution of staffing and budget allocation based on workload across the different EDs within Australia. Gedmintas, A., Bost, N., Keijzers, G., Green, D. and Lind, J. (2010). Emergency care workload units: A novel tool to compare emergency department activity. Emergency medicine Australasia, 22(5), 442–448. © Copyright Audra Gedmintas, Nerolie Bost, Gerben Keijzers, David Green & James Lind, 2010.